If evidence were needed that America is turning on to soccer like never before – and that good quality teams can attract massive live audiences – then look no further this weekend than the Champions League final rematch between Barcelona against Manchester United at FedEx Field just outside Washington DC. The home of the Redskins will be packed to capacity and it won’t be the only huge crowd of the summer. You’ll see New England Revolution drew more than 50,000 as they lost 4-1 to United earlier this month, while LA Galaxy attracted more than 56,000 as they lost by the same score to Real Madrid. There have been other crowds in the 50 and 60 thousands. Of course there have been some smaller gates for smaller names but the interest is there – and real, and growing. And the Big One this weekend is the cherry on the top. It’s the rematch. Barca v United is truly the most marketable redux. The growth in popularity of these two clubs and of the sport in America is evident when examining the increase in viewership of the 2011 UEFA Champions League Final – 4.2m viewers tuned in on 28 May to see this power packed matchup, a 91 per cent increase over last year. It was 86 per cent up on the same pairing in the fixture in the final in 2009! Furthermore, Washington, DC carried the highest TV rating (3.3) ahead of local markets Seattle (2.9), New York/Providence (2.8), and Los Angeles (2.7). FOX Deportes’ Spanish-language coverage on the 2011 final was the highest-rating Champions League match ever on a Spanish-language sports network, up 206 per cent on the 2010 final. This rematch is a tale of two cities, two gigantic brands. United were recently named the most valuable sports franchise in the world by Forbes magazine at $1.86bn (£1.15bn). They are the reigning champions of the world’s most lucrative league having claimed their 19th championship breaking the tie with Liverpool for the most league titles. Barcelona are ranked only fifth on the Forbes list, valued at $975m (£599m). Yet as sportingintelligence’s most recent salary report showed, Barcelona players earn the highest salaries in all of football, 15 spots above Manchester United’s average player pay. Barca players raked in £95,081 per week (£4.9m per year) in the period reviewed while Manchester United pay two-thirds that amount per player, or £61,373 per week (£3,2m per year). Lionel Messi and Wayne Rooney are the best paid players at their respective clubs with large six-figure weekly pay packets. Arsene Wenger scoffs at such excess. Can it be said without incredulity that Barcelona are a microcosm of Spain since both team and nation appear to have spent themselves into deep debt? Perhaps, but one wouldn’t want to generalise about Barcelona representing all of Spain in any other area. Catalan is spoken with fervor in only the eastern territory of the Iberian peninsula, and over the years of this football club’s existence – a publicly owned institution similar to the Green Bay Packers in Wisconsin Stateside – the club’s identity has been woven into the fabric of this flavorful culture wrapped in appropriately colorful kits. (Note: Barca and ‘the Pack’ each won their respective world championships in 2011). The people own the team, and the people are willing to spend to win. But winning isn’t everything, is it? Try telling that to Sir Alex Ferguson. Surely only one thought will cross the minds of the Red Devils on Saturday wearing their fresh blue and black away kits: revenge. To the organizers of the World Football Challenge, this dream rematch means something altogether different: Ker-ching! No Messi? No Chicharito? No problem. 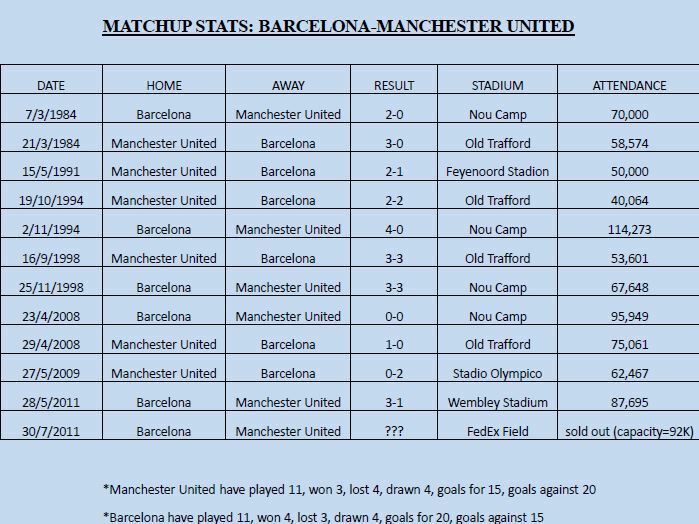 In this game – the world’s game – it’s a winning argument to say that a truly marketable rivalry has developed between Barcelona and Manchester United, the clear number one and number two football clubs in the globe. Jeremiah Tittle is manager of sports programming for Sirius XM Satellite Radio overseeing production on The Football Show with Giorgio Chinaglia and Charlie Stillitano and Basketball & Beyond hosted by USA Olympic head coach Mike Krzyzewski. He also serves as an adjunct professor at the Phillip Merrill College of Journalism at the University of Maryland. Follow Jeremiah on Twitter at @wwwjt.